Are you planning a Smoky Mountain Vacation or Gatlinburg family reunion and looking for a photographer? I'm here to help! We can work together to capture your large or small family at their best. Imagine playing in a field with your family with the mountains in the background, trying to spot critters with your little ones. Let's create those vacation memories while taking gorgeous portraits you can show off back home. The Smoky Mountain National Park is one of my favorite places on earth and I LOVE to do sessions there in the natural beauty. I am authorized to legally perform sessions inside the park for my clients. Both immediate and extended family sessions are welcome in Pigeon Forge and Gatlinburg. Please include grandma and grandpa in those beautiful pictures; they will be priceless. There's no additional fees for large groups when you use my photography services. Feel free to include the whole gang. I'll be happy to suggest a location based on your preference; at times I'm able to come right to your cabin to take your family vacation pictures just steps from your door, making your session super convenient. 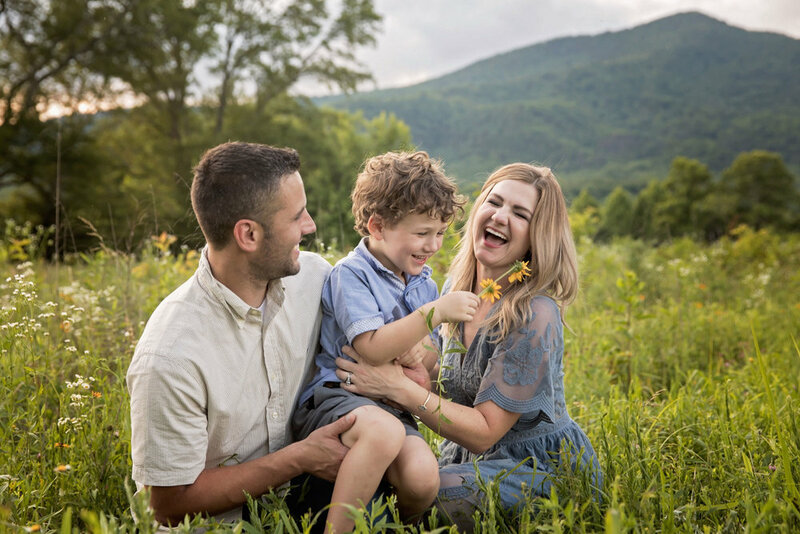 Our weather can be a bit unpredictable, so I suggest booking your session early during your visit to the Smoky Mountains to give us some backup dates just in case. I want this to be a fun experience for your family, so please feel free to ask questions and allow me to help you set up your perfect session. Finally! You have the whole family together in a picturesque location; it's the perfect time for pictures. You want to capture everyone as they are right now and make some fun memories in the process. I'll take care of capturing those memories for you with a Gatlinburg photography session. Styling help is included to coordinate your clan perfectly. If you're in need of family vacation photos, send over a message to alisha@alishabaconphoto.com or use the form below. Drop me a line to start planning your Pigeon Forge or Gatlinburg session! Please include your travel dates and package requested to expedite your booking process. Custom packages available by request.